Please send check or money order to the address above with preferred delivery address for a subscription to The Coast News publication. 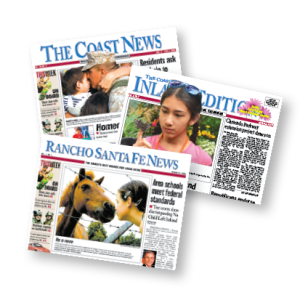 Subscriptions are not offered for the Rancho Santa Fe News nor Inland Editions at this time. Please do not copy your inquiries to more than one person on our staff. We will make sure it is sent to the appropriate person. Also, in general, the editorial department does not accept releases via fax. If you have a calendar item, email it to calendar@coastnewsgroup.com.